Well, well, well! Another month, another make for the Minerva Blogger Network! I think one of the best things about being involved in the network is the opportunity to try out different types of fabrics that I wouldn't normally go for. This time round, I opted for some Tie Dye Velour, which is ironic really because two of my least favourite decades in the fashion stakes are the 70s and the 90s! Nonetheless, I quite like this dress. I used my Sewaholic Renfrew Top pattern as a basis for this make, shortening the bodice pieces to hit at my waist and tapering them in for a close fit. I then drafted rectangular skirt pieces, opting for a shorter length to stop the dress from looking frumpy. I used elastic to gather my skirt panels, with the help of a great tutorial from Anna at Paunnet. Mine didn't come out as evenly gathered as I wanted, but with a bit of practice I hope I can improve my technique for next time. Initially I planned on a neckband and cuffs, but when I attached the neckband it was too stiff and ended up distorting my neckline. I think this is because even though the velour is really drapey, it's bulkier than other knit fabric. After removing the unsuccessful neckband, I decided against cuffs too. I ended up finishing all edges (neckline, sleeves and hem) by overlocking, turning under once and top-stitching with my twin needle. There's really not much left to say about this simple make. On the fabric front, my velour was mostly fine to sew with and the wrong side has a nice smooth finish, giving the impression of being lined. Do beware though, because velour tends to fray and the edges curl up like nobody's business. You also need to take the fabric's pile into account when cutting out your pattern pieces. 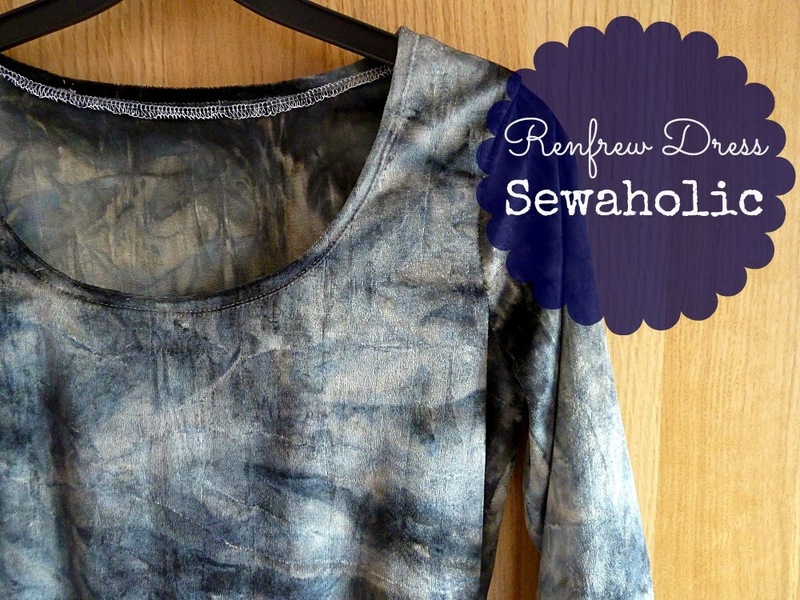 I really like the somewhat grunge edge of my Renfrew dress, although I suspect that it has something to do with how over-exposed my photos came out! So, what do you think - yay or nay to tie dyed velour? I like it on you - a bit different from your usual style though! Yep, it certainly is, but thanks! It looks great. You are so clever to think of it as a dress. Its nice to try out a different fabric and style! Thanks Stevie, a bit of experimentation is a good thing! I think this is a really flattering dress, and the tie dye gives it an edgy rebellious feel. What a grunge princess! Will it be this one you wear to the meet up day? I really like it, but then I'm a grunge girl at heart. Good work on going out of your comfort zone. I tried to avoid drapey fabric at first because I was worried people reading don't like sewing with them. But now I'm over the moon with my upcoming drapey projects! Aaaw, thanks Amy! Not sure what I'll be wearing at the day event...depends on weather I guess ;o) I love the wonders you work with drapey fabric! I love it! It looks great on you. Your dress shows that sometimes it can be good to set aside prejudices! I would have said no to both velour and tie dye, but your dress is AWESOME so obviously I am wrong! I think the fact that the tie dye is neutral makes it more sophisticated -- perhaps that is a clue to why it works so well? Ah, Marie, this is so cool! It's really different but I think it suits you really well. Super cute! I wish I had this exact dress! Go ahead and make yourself one, it's really easy! Super duper yay yay. I'm not super into the 90's revival (it makes me feel old) but some stuff is awesome. Like docs, flannel shirts and velvet. And baby doll dresses. And Bodysuits, obviously. Maybe because I actually wore that stuff, I like seeing it again. Less into the ugly mom clothes/normcore side of it but that another matter. You look great and I would totally steal this dress from you! Thanks Heather! I feel exactly the same about the 90s revival, but I'm glad I could make this dress work! Woo Hoo! This is a fun dress! You look like a grunge princess! I'm digging it! Oooh, I love being called a grunge princess! really pretty and charming, looks comfortable and versatile. There's something smoky and fun about that fabric. i like what you did with it. i'm not really a velor or tye dye kind of girl, but i love this! such a fun dress, nice job! Now generally, the words 'Tie dye' and 'velour' on there own would have me dry heaving, and putting them together would have had me actually erupting like a vomcano! In this instance it works splendidly though, well done for looking past the hideous concept and creating this little gem! Hehe, thanks so much! I'm really pleased at how it came out! Hello Rock Chick!!! This is so 90s, I'm all over it. Absolutely love it. Oh boy, I love this! 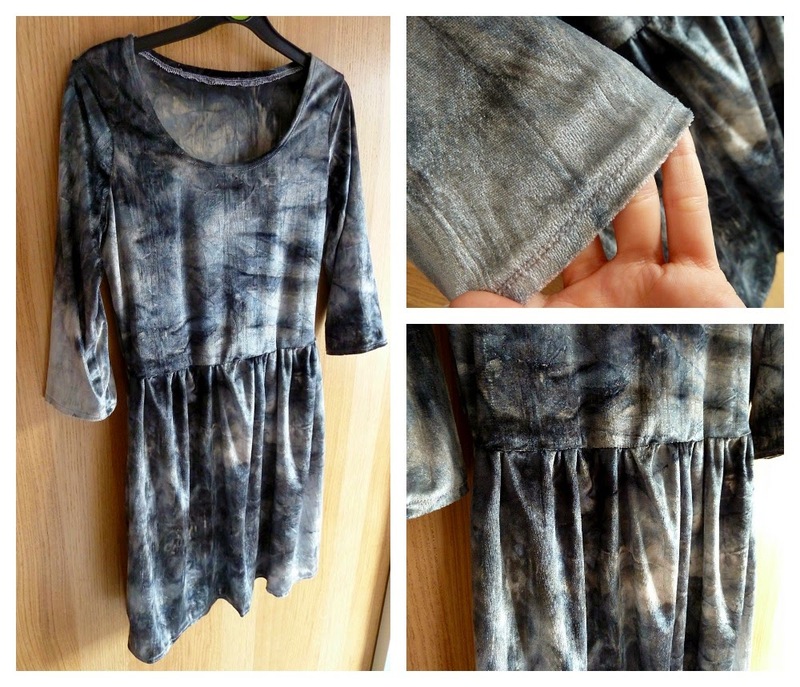 Looks like a frock I made from tie-dye denim, but velour make it even more 90s grungy and cool. Might have to swipe some of this fabric myself. Yay, go ahead and swipe away lady! I think you are the only person that can make tie dye look glamorous! Ahahaha, I'm so not glam, but thank you so much! Ooh, this is totally a different look for you but I really like it! Super cute! Thanks Sonja, I'm glad my gamble paid off! I say YAY. It's definitely different to what you normally make, but I love it. It's pretty rocker-chic and badass, especially with those boots! Yesss, I'm claiming badass thank you very much! Very different Marie. But in a good way! You look great in it I love the tie-dye effect on the fabric, I would never have thought of using this type of fabric. I love it! I was thinking of trying something like this with the Renfrew pattern. This post is really helpful... and I second everyone on how you are rocking the velour tie dye! Glad you found this helpful Kitty! Rock on!! This is so fun and I love the departure from your usual style. I think it is fun to mix it up with different styles from day to day. Keep 'em guessing!! Thank you, it was fun to experiment like this!